This was an amazing weekend, don't you think? The energy around campus was just flowing. I thought this was a great fall festival. I was so happy to see so many students enjoying themselves, and I was especially glad to see almost 1,000 commuting students taking part in the fun! Now, I guess it's back to the books for a majority of you since it's important to find balance between your social life and academic studies. 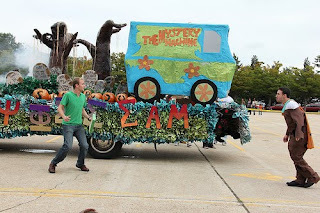 Shout-out to the new best way to get to campus, the Scooby-Mobile. The Secret's Out - Networking Works! Accounting and Finance Fair - Were You There? Glitter and newspaper and chicken wire, oh my! Seniors! Want to be a part of Hofstra royalty?